MediaCorp artiste Tay Ping Hui’s 郑斌辉 directorial debut, MEETING THE GIANT 《再见巨人》 unveils its official regular poster! The movie is set to release on 19 June during the summer school holidays! Promotional activities for the movie are line up accordingly such as the press conference and gala premiere on 11 June; the MEETING THE GIANT Street Basketball event happening at Plaza Singapura on 14 June! MEETING THE GIANT is the brainchild of MediaCorp’s veteran actor Jack Choo 朱厚任, starring Ian Fang Wei Jie 方伟杰and a group of new faces which includes Ng Han Bin 黄汉斌, Delvin Goh 吴国江 and Lim Shen Yu 林圣宇 who are professional players from Singapore Slingers (a professional basketball team that competes in the ASEAN Basketball League). 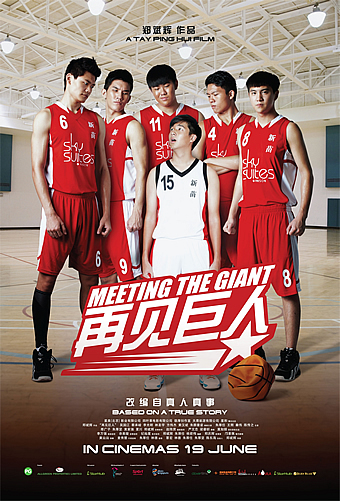 MEETING THE GIANT is based on a true story and talks about a coming-of-age tale of a team of Chinese basketball players trying to achieve their dreams in Singapore. The movie also showcases sophisticated basketball stunts and absolute sportsmanship of the boys.